The inside story of the political collpase of the Soviet Union is far better understood than the course of economic and social disintegration. 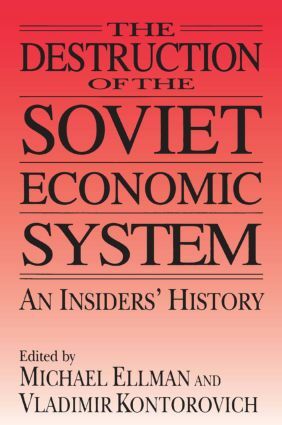 In order to capture the story, the editors compiled a list of questions which they addressed to former top Soviet officials and economic and other policy advisors (both Soviet and foreign) who were privy not only to data on the functioning of the Soviet economy but also to the internal policy debate during the 1980s. This volume assembles the Informants' analyses of key issues and the turning points, and weaves them into a compelling history of systemic collapse. Among the topics investigated are: economic policies in the 1980s; the standard of living: the reliability of Soviet statistics; Gosplan's projections for the economy to the year 2000; was the arms race starving the civilian economy? the role of ideology in supporting the functioning of an economic system; the party's participating in economic management; the influence of foreign advisors; the struggle over a transition program; the functioning and collapse of the supply system, the CMEA, and the foreign trade system. This text on contemporary Russian foreign policy identifies continuities in Russia's international behaviour, despite regime changes, and the basic factors structuring these long-established patterns. It also analyzes some of the external and internal forces that influence changes of policy direction, not all of which are predictable. The result is a balanced treatment that should provide readers with the context and the analytical tools needed to understand Russia's past, present and future role in the world.